We’ve made a few small changes to the Achiever system, please read on for more details and notice of an upcoming change which will affect all users. We’ve added ‘Visit Number’ to the sample screen, which is useful for teams who wish to assign samples to a particular visit or session without the overhead of a custom clinical data form. When inserting samples in bulk, the samples grid would not refresh by default to show the new samples. This could be confusing and now the sample grid will automatically refresh. A new field has been added to the Informed Consent form to capture restrictions which are not catered for by the existing opt-out fields. Entering data into this free-text field will result in a warning being displayed on sample records linked to the participant, just like it would with a specific opt-out. We are also taking the opportunity to remove unused fields ‘CTR Code’, ‘Tumour Type’, ‘Growth Properties’ and ‘Growth Medium’ fields. Other changes are possible, and we are planning on introducing a Barcode field, for users who use pre-barcoded containers or receive pre-barcoded samples. Keep a lookout for these changes towards the end of the week. If you have any questions or comments please let the team know. Just to mention a couple of updates we’ve made to Achiever. These are now active on the Live environment and we hope to refresh the Training environment very soon. When creating multiple new donor records it can be laborious linking them to the same collection each time. Now you can avoid that step of the process by creating the Donor/Participant records from within a Collection. Simply follow the ‘Insert New Donor/Participant’ workflow from the Collection’s Participant grid. You will be asked to search for existing records as usual, before entering informed consent details – but you won’t have to select the collection. Some teams prefer to use the grid-style ‘A1’ notation when referring to the position of a sample within a storage sub location. Now, when you follow the check-in workflows, the position picklist will display both the numerical place as well as the grid notation for the best of both worlds. Users have been using the ‘Diseases’ functionality of Achiever to store Clinical and Episodic data related to a specific disease. The value of creating custom forms to store data combined with the potential to link these episodic datasets to groups of samples is useful for more than just specific diseases. Therefore we have re-captioned this section as ‘Clinical Data’. All functionality remains the same, but please be aware of the new terminology. The previous workflow to link a sample to Disease/Episode is now known as ‘Link to Clinical Episode’. Up to now, users have needed to scroll the collection participant grid in order to view the ‘status’ field and click the hyperlink to open a participant record. Now the first column ‘Participant ID’ is available as a more suitable hyperlink to open the participant record. In addition we have made the External Reference column a hyperlink which will go straight to the donor record. 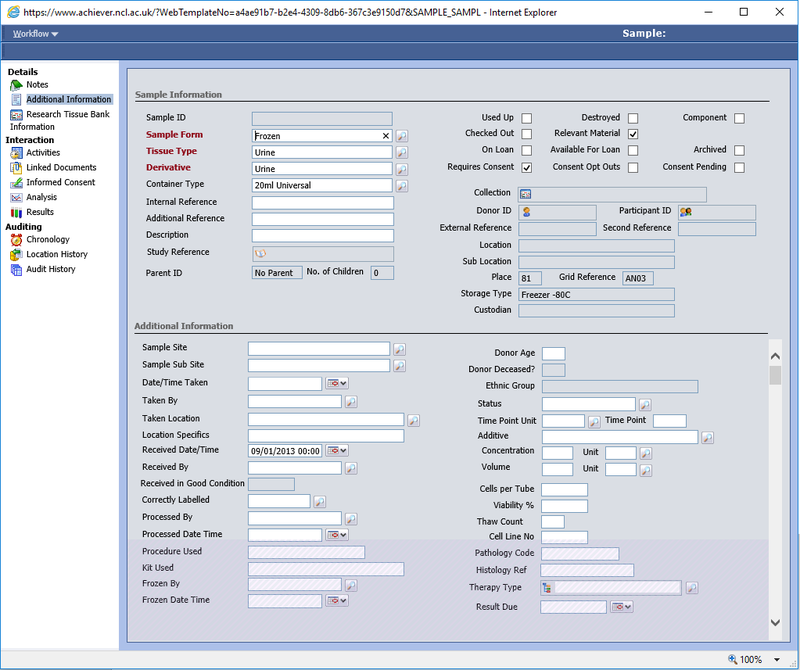 Individual collection information forms which were previously visible depending on the value of the collection type field (eg Clinical Trial Information, Research Tissue Bank Information) have been merged into a single ‘Additional Information’ form. This allows fields to be displayed if they have data in, even if the collection type value changes. If you have any questions or comments please let the team know. The Training environment will be refreshed with these changes in due course. Just a quick note to inform users that the Training environment has now been refreshed with all recent configuration updates from the Live system. All collections from the previous training environment have been retained, alongside anonymised versions of data from Live. Please let us know if you find any issues. You will now be able to see the donor-level field External Reference from the Participant screen and Sample screens, and also the participant-level field Second Reference from the Sample screen. This sample-level field was previously read-only, and populated automatically only when the donor date-of-birth, and sample date taken were known. Now users are able to manually complete this field. It has also been added to the ‘update properties’ workflow to allow users to amend samples in bulk. When inserting a new Donor, the mandatory search will now look for both External Reference and Additional References from the same field. When splitting samples without changing the derivative, previously users were required to re-enter the Sample Form, Tissue Type and Derivative fields. We have now added a new workflow which creates new child samples of the same type. This is much more straight-forward and lowers the risk of error. Simply choose ‘Split Sample(s) (Simple Aliquots)’ from the Sample grid within your Collection or Participant. The workflow is similar to the standard split, but instead of choosing how many derivative types to make in the first window, the user chooses the quantity of child samples to be created. Users can now now select the Update Properties workflow from the Sample grid within a Participant record. We have also added the ability to update the Additives field within this workflow. Please note that as the field can store multiple additives, items chosen here are added to any existing data. Some teams use the Sample Site and Sub Site fields prolifically in their sample recording. When creating samples this previously meant users were required to follow two update processes, but now we have introduced those fields into the Sample Group Insert workflow. This functionality is available to specific teams on request. Please let us know if you’d like this functionality to be available for your team. When records are deleted in Achiever, they are moved to a holding area where they remain indefinitely. We have introduced an automated process which will permanently remove these deleted records 90 days following deletion. Users wishing to recover data deleted by mistake are required to raise a ticket as soon as possible. Records should only require deletion if they are entered in error – please remember to use appropriate workflows to mark samples as used up/destroyed for example. For teams who receive and catalogue samples in advance of their consent, the expected consent details are usually added to Achiever with a status of ‘Pending’. If consent is not forthcoming this status can now be updated to ‘Refused’ so that accurate records are kept. Note: these changes will not be available on the Training environment until it has been refreshed, which is due in the upcoming weeks. Don’t hesitate to get in touch if you have any questions or concerns. You can also join our Yammer group to share ideas with other Achiever users across the University. We have recently added extra fields at the Sample level to store time point data. This is useful to new teams who are adopting Achiever, who wish to store this data explicitly rather than relying on existing free-text fields such as Sample Description. You will find the fields below the Description field on the Sample form. The currently selectable options for Unit are Minutes, Hours, Days, Weeks and Months. As with all fields on Achiever, they are available for inclusion on any relevant search grid. We’ve recently made a couple of changes to Achiever which you may notice. The first is extra grid views on the Collection and Study screens, with a further global view available from the Clinical tab. These lists show Participants who have opt-outs flagged within their Active consent records. It helpfully displays which opt-outs have been marked, which up until now would have required the user to go into each individual consent record to check. The other change you will see on the Donor screen. Here, we have added an extra field to store ‘Additional References’ – some teams acquire samples which come with a range of reference numbers at the Donor level and it’s useful to keep this data to aid with searches. As always, if you have any questions about these changes or anything else Achiever-related please get in touch! We’ve recently rolled out some updates to Achiever functionality. The first is that, similarly to the previous update allowing backdating of checking-in samples, you can now backdate checked-out samples. We have also added a new field to the sample screen to accommodate the needs of some of our new users. ‘Viability %’ is optional and takes a number value. Finally, and more noticeably we have altered the wording of the process formerly known as depletion. There was potential for this to cause confusion as many users do not expect depletion of a sample to mean that there is nothing left (ie they are just using a portion of the sample). Therefore this term has been renamed to ‘used up’ to confirm its original intent that the entire sample will be no longer available for storage or use. Alongside this, other sample workflows have been changed slightly to adhere to a more consistent convention. Sample workflows selected from anywhere within Achiever, such as the collection, participant, study or sample itself should be named uniformly. Please be aware that while these changes do appear on the Live system, the Training environment has not yet been refreshed, so won’t feature some of these changes. The Training environment will be updated in due course. Just letting you know about a couple of small changes that have gone live recently. The first is simply an option to allow bulk restoration of samples that have been depleted in error (undepletion). This is available from the collection, study and participant-level sample grids for the same staff roles that have the ability to deplete. Following a bulk undepletion, the user will be presented with a sample summary of those samples. This allows the user to check-in the samples efficiently, as storage data will have been removed when the samples were initially marked as depleted. The second addition is to allow users to enter a custom date and time when checking-in samples. Previously the sample location history would store the date/time that the action was performed on the system, so this allows for more accurate records if there’s a delay between checking-in and updating Achiever. As usual, please let the Achiever team know if you have any queries or concerns – thank you.